10-30-2012 Weekly meetings are now happening in Burnaby on Mondays 11:30-1:30 in AQ5035 and in Surrey on Tuesdays 4:30-6:30 in room 2710. 09-12-2012 GDC will be at clubs week in Burnaby on Thursday Sept 13th and in Surrey on Wednesday Sept 19th and Thursday Sept 20th. Make sure to come by to register and say hi. 04-26-2011 We had good turnout at our Board Game Jamboree today. Check out the event page for more details! 01-06-2011 Welcome back for another semester! We will be at clubs days on the mountain Tuesday(18th) and Thursday(20th). At Surrey it will be the week after on Tuesday and Wednesday. 12-23-2010 We had a merry olde game jam over the winter break. You can take a look at the results by going to the events page. 09-20-2010 Meetings this semester: Surrey will be meeting Wednesdays 2:30 - 5:30 in room 3260. Burnaby will be meeting Fridays from 12:30 - 2:30 in BLU 11911. 09-05-2010 GDC is at the week of welcome. 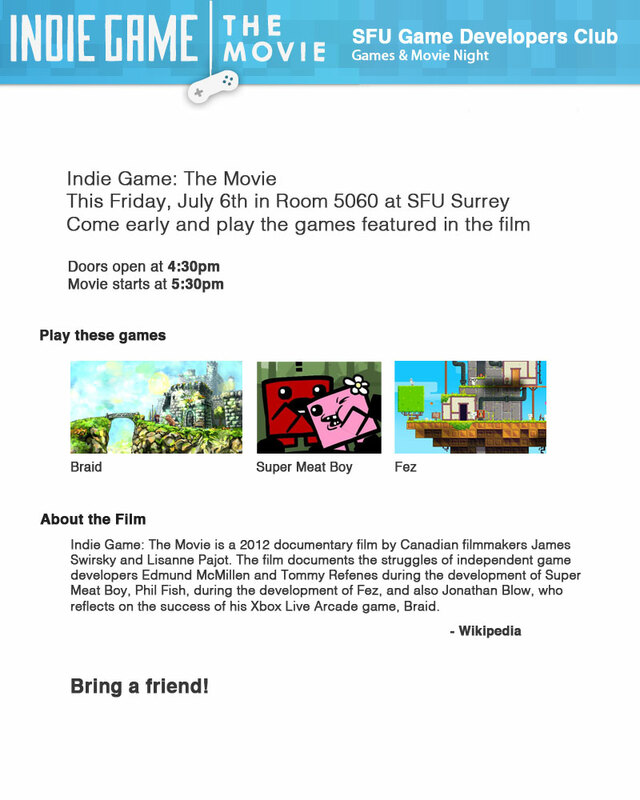 Come say hi on Tuesday/Wednesday at Burnaby and Thursday/Friday at Surrey. Do some quests and earn sweet loots! 09-05-2010 Posted some pictures of the summer Tabletop Game Jam. 08-31-2010 We have been steadily improving the website by reorganizing sections and styling them. We're far from done but let us know what you think! 08-30-2010 Added Evil Genius VS Spies and Wordworks to the completed projects list.